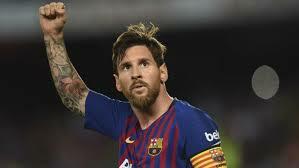 Real Betis fans were applauding by the end as Lionel Messi scored another hat-trick to fire Barcelona to a 4-1 victory yesterday and leave them with one hand on the La Liga trophy. Messi’s treble, his second in a month, fourth of the season and 51st of his career, moves Barça 10 points clear of Atletico Madrid with 10 games left to play. Meanwhile, a record crowd of 60,739 watched a women’s match between Barcelona and Atletico Madrid at the Wanda Metropolitano yesterday, less than three months before the start of the World Cup.